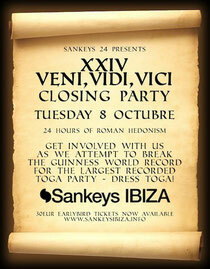 With a lot of top parties to come in 2013 at Sankeys Ibiza, the venue recently released a heads up on the club's closing party on October 8 where they'll be trying to break the Guinness World Record for the largest toga party in history. After what should be a top season of electronic music, they plan to raise the levels of hedonism to Roman-sized proportions as the club invites everyone to dress in toga for the final rave of the season. There will be more info to follow on the closing party line-up, which continuing on the theme from last year, will include a few special surprises along the way. In the meantime, check out the 'Behind the Soap Story', the latest episode of Sankeys TV for an interesting behind the scenes look at the club.